No moderator. No elimination. No werewolves. A 10 minute game that keeps you coming back for more. 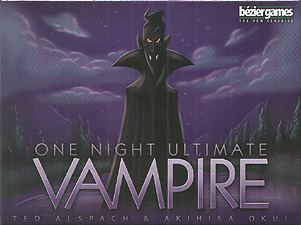 One Night Ultimate Vampire is a fast game for 3-10 players where everyone gets a role: The nefarious Vampire, the well-meaning Cupid, the sneaky Assassin, or others, each with a special ability. In the course of a single evening, your village will decide who amongst them is a vampire...because all it takes is finding one vampire to win!